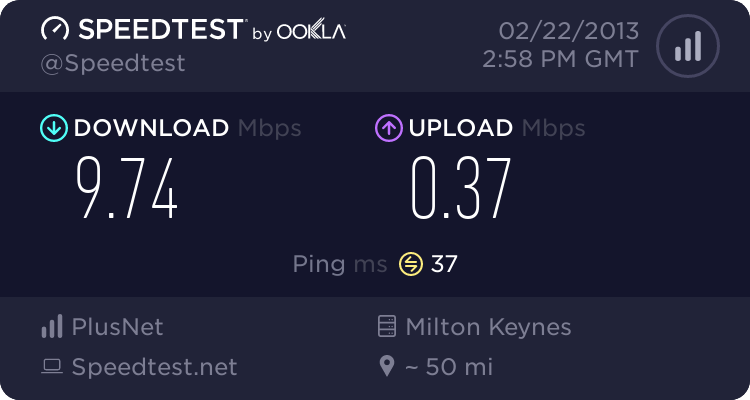 Hi, I have recently been having some serious issues with my broadband connection ....Click Here. And I was wondering if anyone would like to share their story here!!! I am fairly new to this forum so am unaware of any community rules but I would like to ask peoples options of Broadband within the Community. I am starting a SpeedWave where we can determine the average speed of the exchange within Barnoldswick. I would like to ask what provider you are with and I would also like to ask for postcodes so we can work out the length of your line to the exchange. Earby are becoming FTTC enabled before the end of the year whilst the Barnoldswick Exchange wont be enabled until at least September 2015!!!! My Postcode is: BB18 5SE and my line is approximately 934 meters long. Have you looked at the topic 'Computers, the agony and the ecstasy'? Broadband speeds and experiences fully documented on there. I certainly have! But I am wanting a comparison so I though a new thread may be easier. I have left a link on the other thread. I am suddenly interested with this as somehow I got involved with B4RN... My school is in Wennington and they are getting hooked up! Is there a proviso for how much that it would cost to become fibre enabled? Yeah it's ridiculously high! I can't remember how much they raised although one of the ladies involved explained it to me! Mind boggling how they have managed to do this! My headteacher is well involved with this project and the school owns several shares itself. The only worry I have is that some business will move into Bentham or elsewhere and build a data centre, if they bonded a few connections they would have a lot more speed for their buck! The only other place on earth with consumer broadband being that fast is in Kensas City with Google Fiber! Puts BT and their FTTC project to shame! Wow that's fantastic! How did you get that high? Or are you using the Bright box router? I used to be with orange but they got to costly and cancelled the second line! I have the Orange "up to 20MB service" with line rental and evening/weekend calls included for £19 a month. The Netgear router, supplied by Orange and just around the corner from the exchange. Speed can drop to 10.0 Mb/s at busy times but, most of the time, it's fairly consistent at 17.